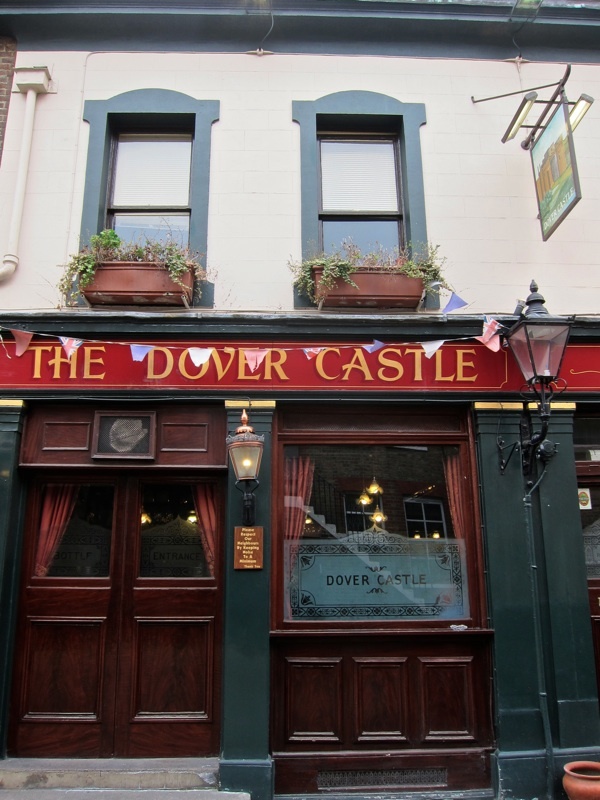 While in Marylebone preparing for my MAGIC LANTERN SHOW at the beautiful Daunt Books, Marylebone High St, on Thursday 20th March, I could not resist the resist the selfless task of visiting all the pubs on behalf of my readers – & I hope you will join me for a drink at the Dover Castle, Weymouth Mews, next Thursday after the show. Ha! That’s funny! It’s called the Gunnakers! So now I know. The ale house with the pub sign of ole Churchill I mean. Obviously Liverpool is Centre of the Universe ;o) but I must say Daunt books on Marylebone High Street, next Thursday would be most ticketyboo and the place to be. Ahh I’ve loved your forays into Marylebone Village and surrounding area. Thank you oodles! A very selfless task you did on our behalf! 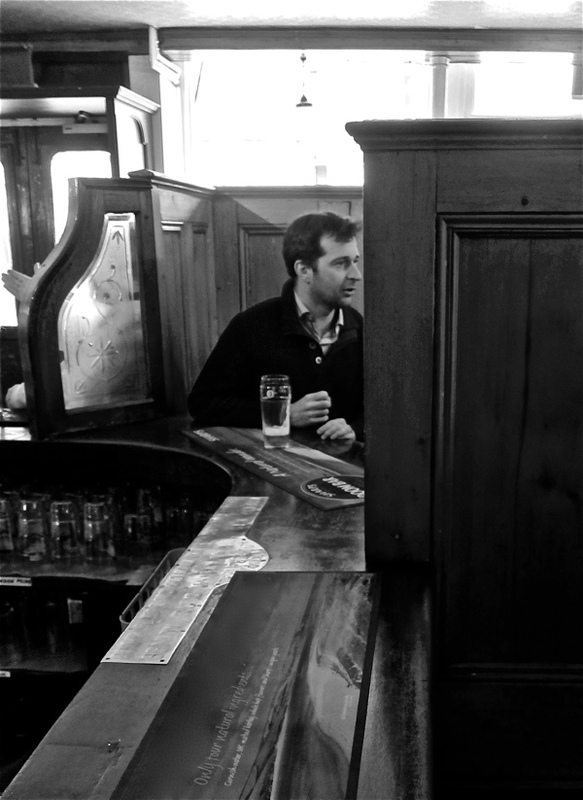 When I lived on Manchester Street (1968-1973), what is now The Tudor Rose was The Lincoln, a pub whose only merit was its Newcastle Brown on tap. 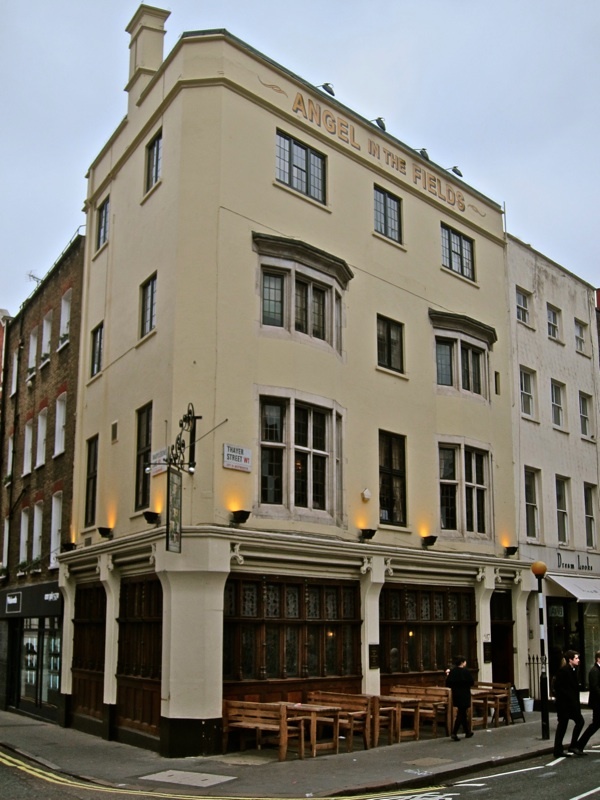 Next time you visit Marylebone, Gentle Author, travel a little east of the High Street to the corner of Westmoreland & Wheatley streets so as to visit The King’s Head. 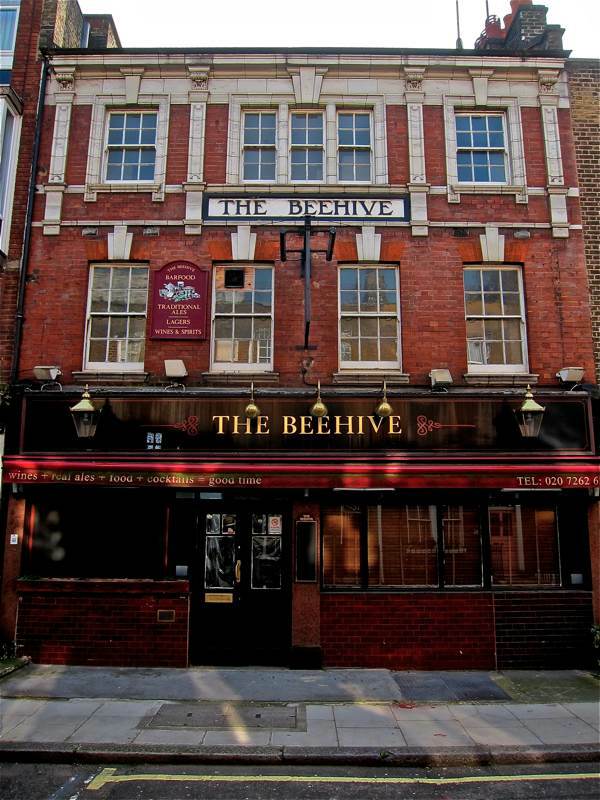 From what I’ve read about its current incarnation, this pub is still as I remember it: a friendly local downstairs with a restaurant one floor up. 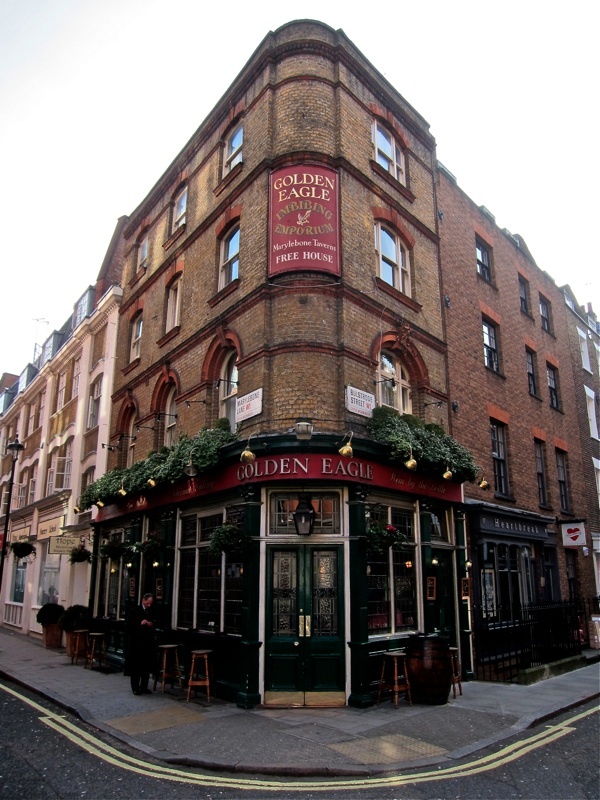 I also have happy memories of The Golden Eagle on the Lane. 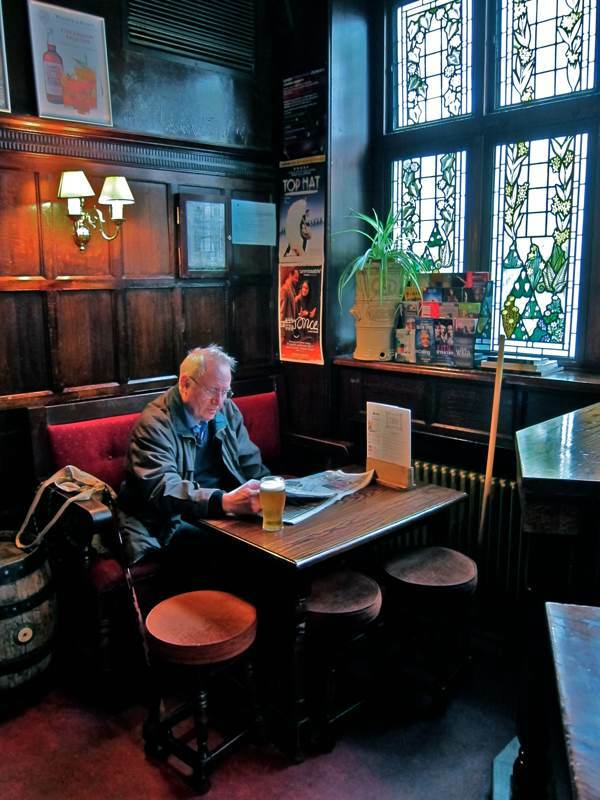 Such kind of pubs, one should remember when in London Town! My apologies – you have included the Golden Eagle – & the Beehive, too. 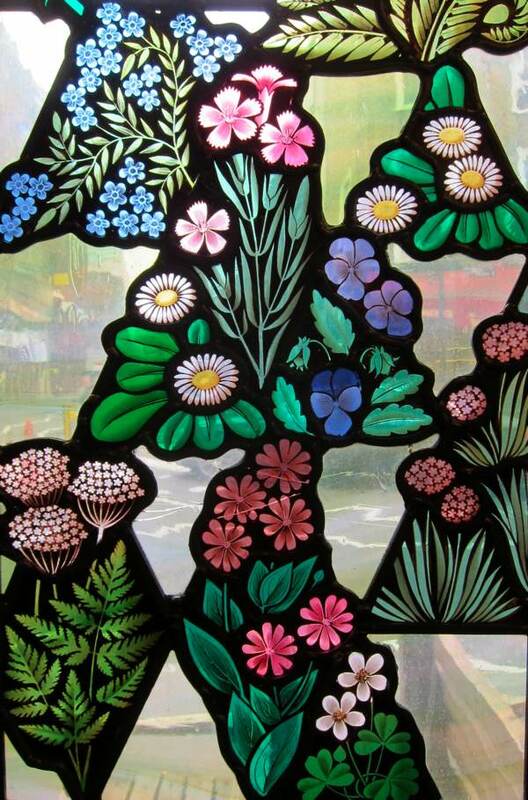 Hope I can make it to Daunt Books …..
Love the stained glass, especially the clover and cow parsley. 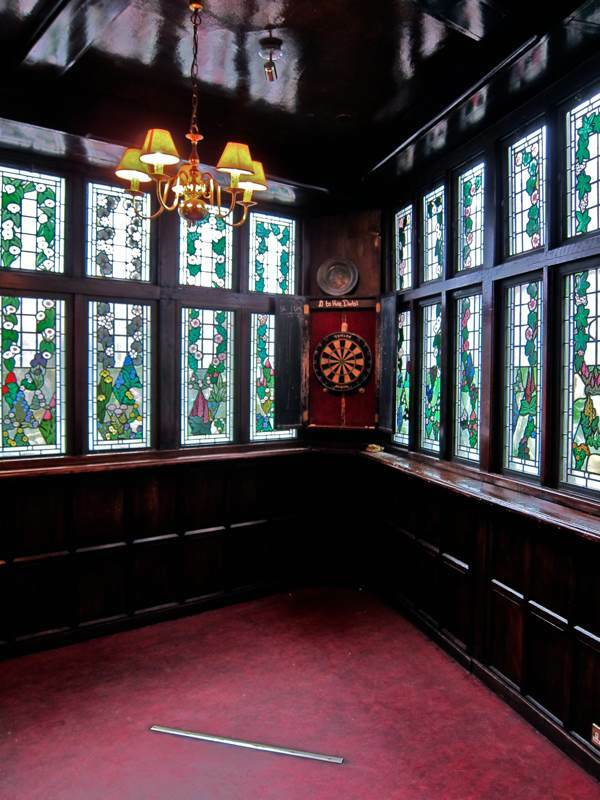 Talking of Liverpool, having lived there for a few years, some of the pubs there have remarkable original fittings still in place. The Golden Eagle has got the whole Flat Iron thing going on. Some great photography, as usual. 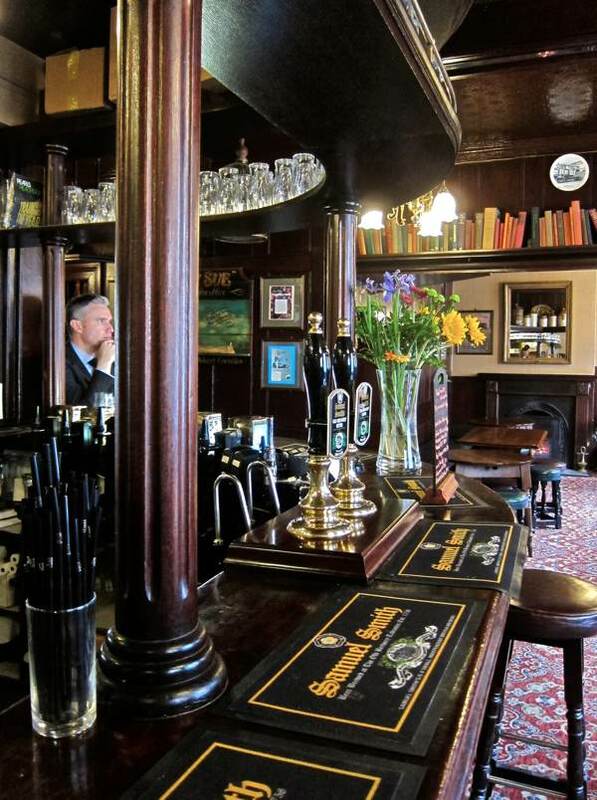 In some of the internal shots you can almost smell the bar maid’s apron. I will certainly join you for a drink! oh, wonderful! the “angel” has always been a favorite and how many times i’ve tried to take photos (timidly) of the windows. your photos are glorious. and yes, how selfless of you! 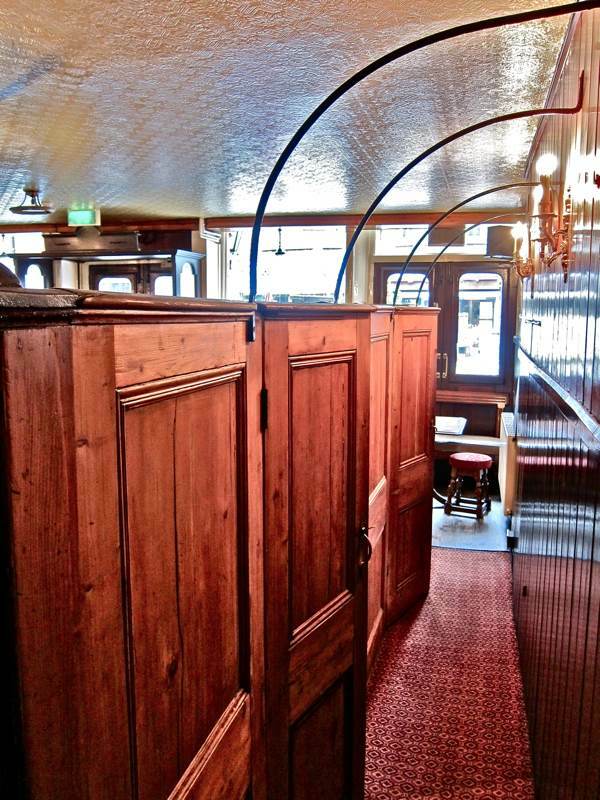 will be trying the barley mow next with those cool booths. 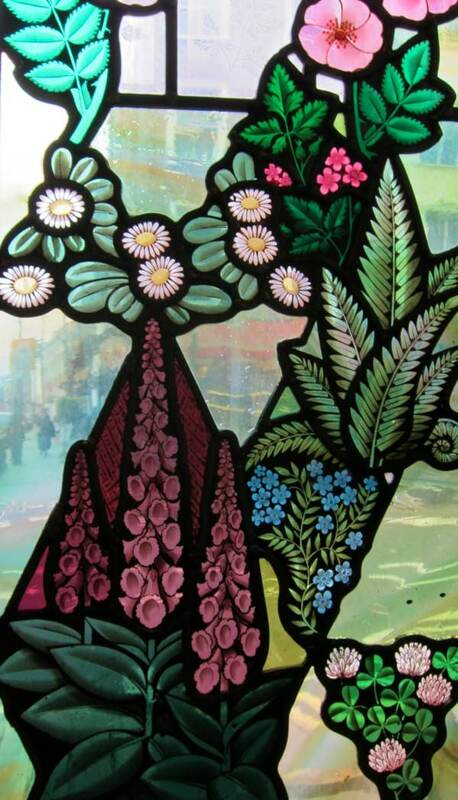 Inspired by the stained glass flowers of the Angel and your previous post about the walk through Marylebone Village – we went in ‘the footsteps of the Gentle Author’ yesterday afternoon and followed your route. A key holder was coming out of the garden in Manchester Square so were also able to go in and see the Wallace building from within the enclave of the square and almost felt like a local. The walk yesterday was lovely. I shall search through your previous posts to see if there’s another we can do today. Perhaps you might one day publish a book of walks based on your posts. Hoping to go to your talk on Thursday, first one I will have been able to manage! 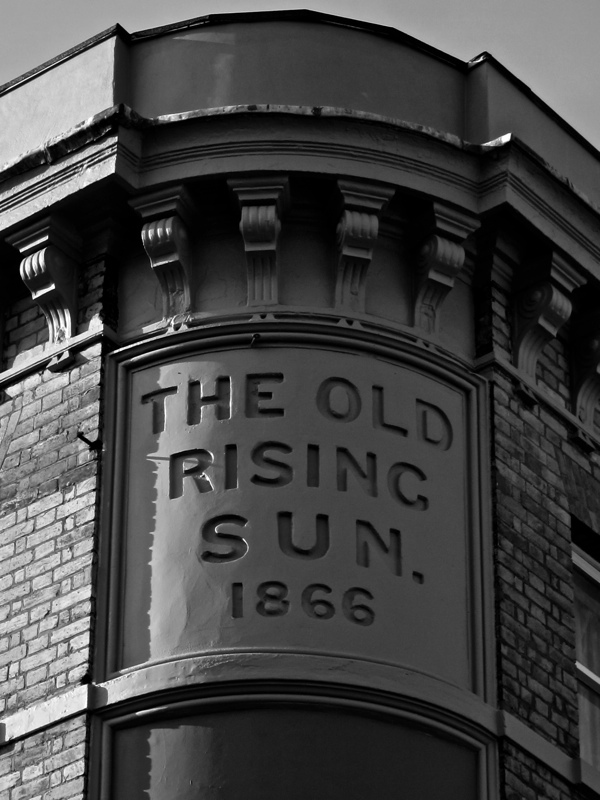 Who ever changed the name of that lovely old pub “The Old Rising Sun” to the Coco-Moc0 should be shot. 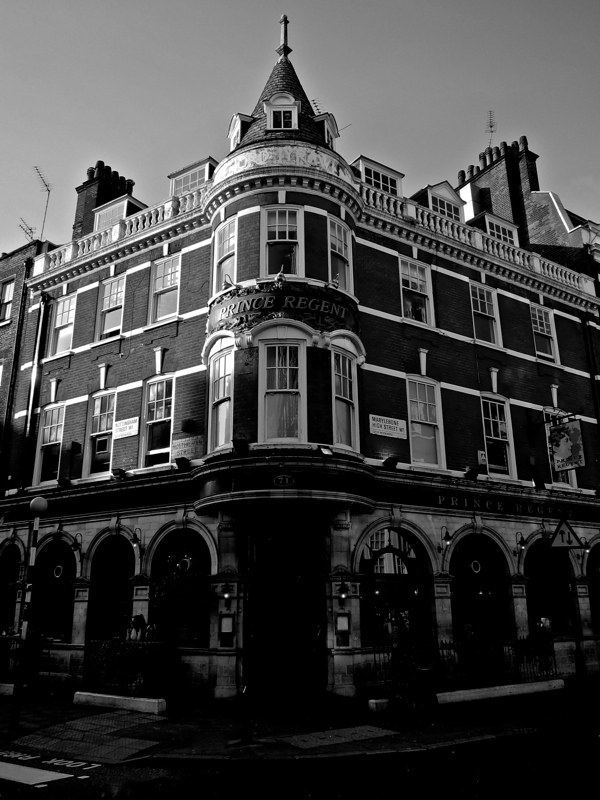 In 1861, my great-great grandmother was a 25 year old servant at the Rising Sun – lovely to see traces of the place are still there. The Tudor Rose PH has recently closed, and there’s a planning application to remove/demolish the exterior pusuant to conversion to a restaurant. 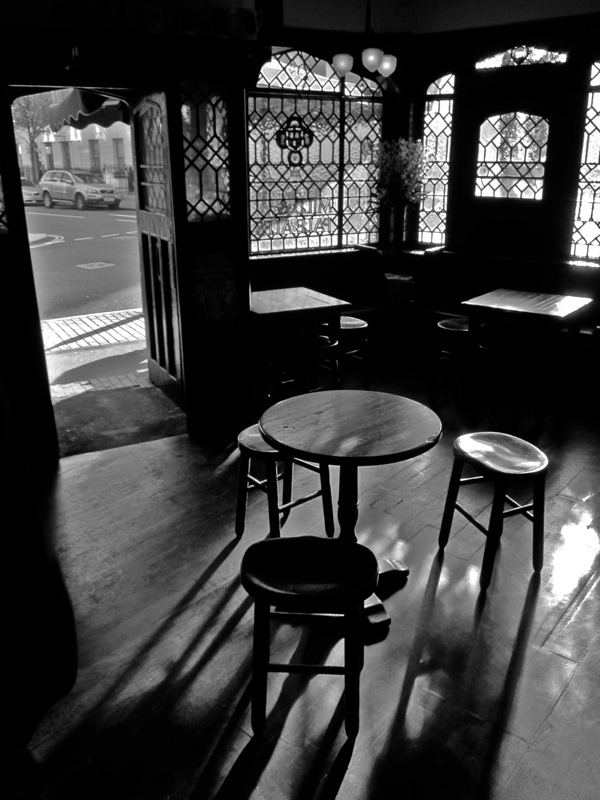 The interior has already been trashed – noted and photo’d last week. Do you have any more interior shots, like the one above, that shows the interior to advantage? Or more on the history, architect, etc? It would be very helpful / useful as we oppose the planning application. 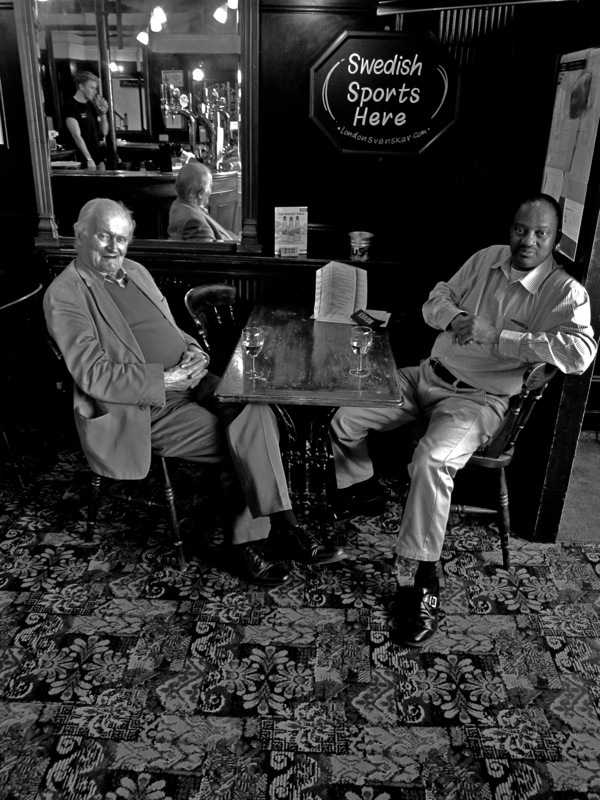 We can’t unfortunately necessarily get the pub back ……. yet another one to be lost in the area, or nearby and across Westminster. I’m writing on behalf of CAMRA West London to bring to your attention the effective loss of this significant building in the Portman Conservation Area, and ask that you consider joining us in making representations on the planning application that proposes removal of the exterior and interior of this public house. 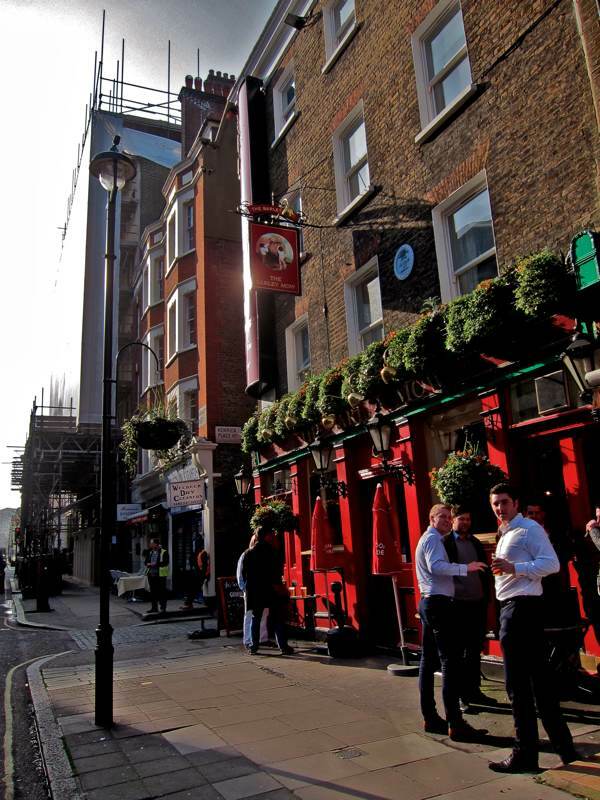 1 The Tudor Rose public house in Blandford Street closed last month as a pub, we gather because the rent increase of 100% was too much for the current licensees. 2 The Tudor Rose (formerly the William Wallace, Lincoln Inn, and Le Fevre’s Coffee House) is a corner pub, rebuilt in 1936 with a mock Tudor frontage probably to the designs of John Quilter for William Younger and Co. Ltd of Edinburgh, and is a significant part of the streetscape. It was previously 20 South Street, Manchester Square and 7 1/2 Manchsester Street in 1869 and earlier. 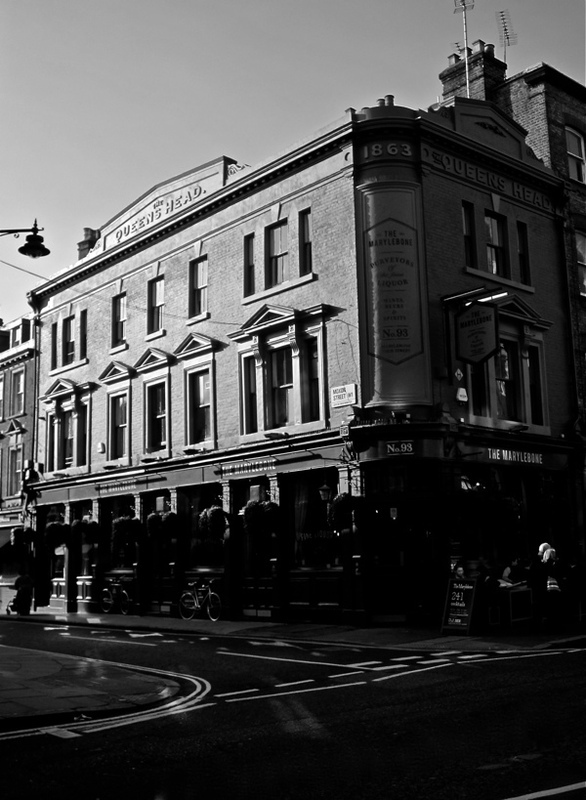 The pub was founded as Le Fevre’s Coffee House, and became the Lincoln Hotel by 1852. 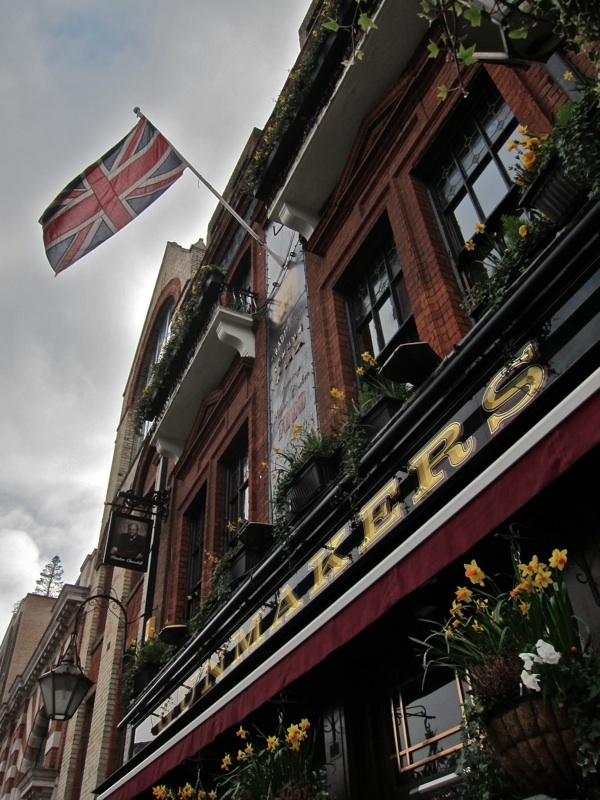 It was later the William Wallace, and was renamed the Tudor Rose in 2000. 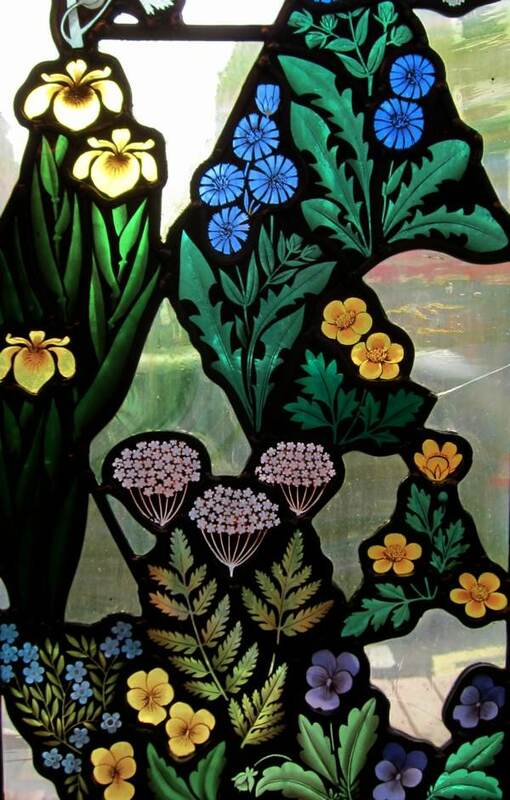 The leaded windows include lettering: ‘WM YOUNGER & CO LTD … EDINBURGH … SCOTCH ALE … MILD & PALE ALES’; there are also small painted panels showing Aberdeen and Edinburgh Castle. 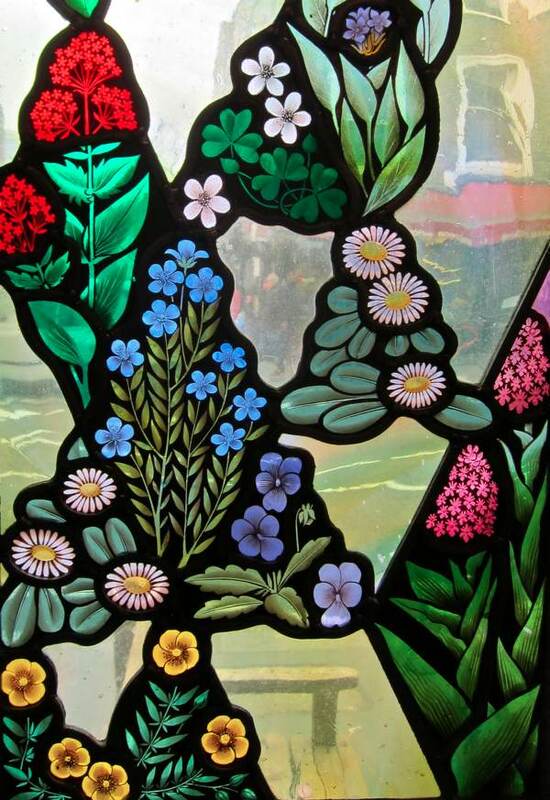 The drainage ironwork features thistles and the initials ‘WY’. 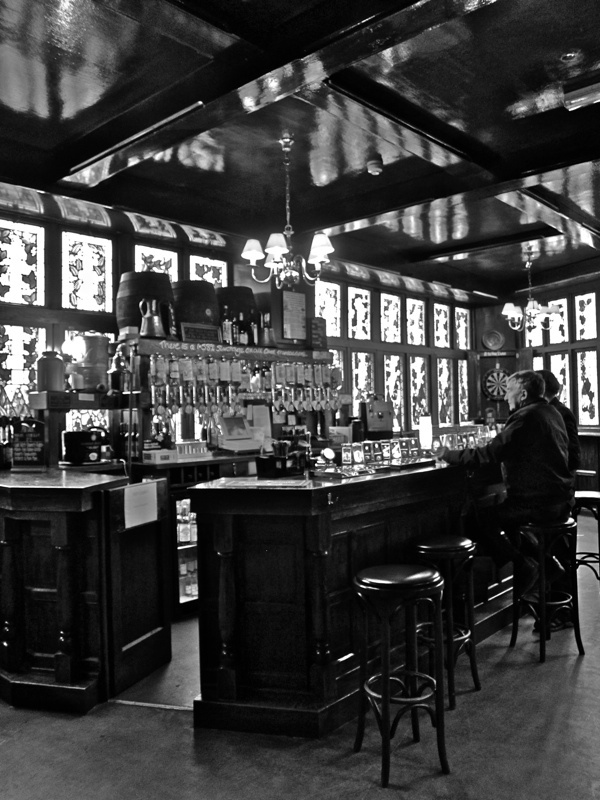 Inside there was a small bar with dark wood panelling and leaded windows, a style favoured by the former owners, Youngers. There is a first floor restaurant and function room. We acknowledge The Brewery History Society as a source for some of this historical material. 3 The intention is for the premises to be substantially changed and opened as Clarette, a restaurant bar, by Le Petit Margaux London Limited with a registered address of Flat 34 Matlock Court, 46 Kensington Park Road, London, United Kingdom, W11 3BS company number 09832862 incorporated in October 2015. One director is listed Alexandra Petit, whose occupation given as ambassador (apparently brand rather than Boris-type) and entrepreneur who owns one share. The two other shares are owned by Tian Bao Consultancy Limited of Hong Kong, and Larrun 10 Avenue de Soleil d’Or Villefranche sur Mer 06230. 4 The planning application has now been validated. It would appear that no change in use class is intended. 16/06540/FULL | Installation of new shopfront and facade alterations, including the replacement of ground, first, second and third floor windows. | 44 Blandford Street London W1U 7H. Attached are the design and access statement, and a visual of the finished ‘job’. Essentially the existing significant features are to be fully removed. There’s nothing about the background, history, etc., or the place the building has as part of the established nature and character of the area. Further details, the drawings etc., that identify what is to be demolished/removed, are available on the web. The building isn’t listed, or noted as being of any particular interest, though given the surviving (largely unchanged?) interior as well as exterior I wonder why not. The wholesale change can’t but have a major effect on the immediate conservation area. 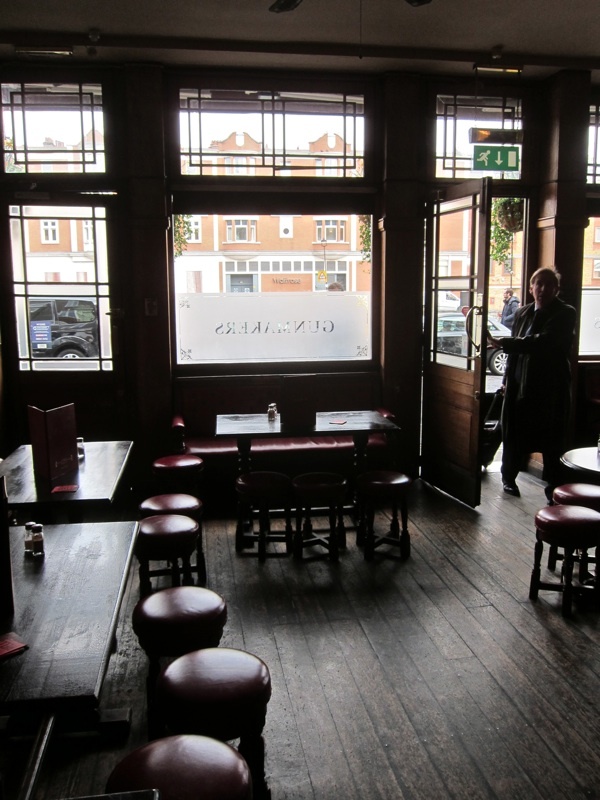 5 We will from CAMRA – both the West London branch and the London Pubs Group – be making strong representations including the loss of this public house and the negative effect of the wholesale demolition of the exterior (as well the interior) on the conservation area. I have also contacted the 20th Century Society to alert them to this application and to ask them to also oppose the proposals. Neil Wilson of the Marylebone Society (e-mail neil.wilson@marylebone.org ) has advised that they are reviewing the application. 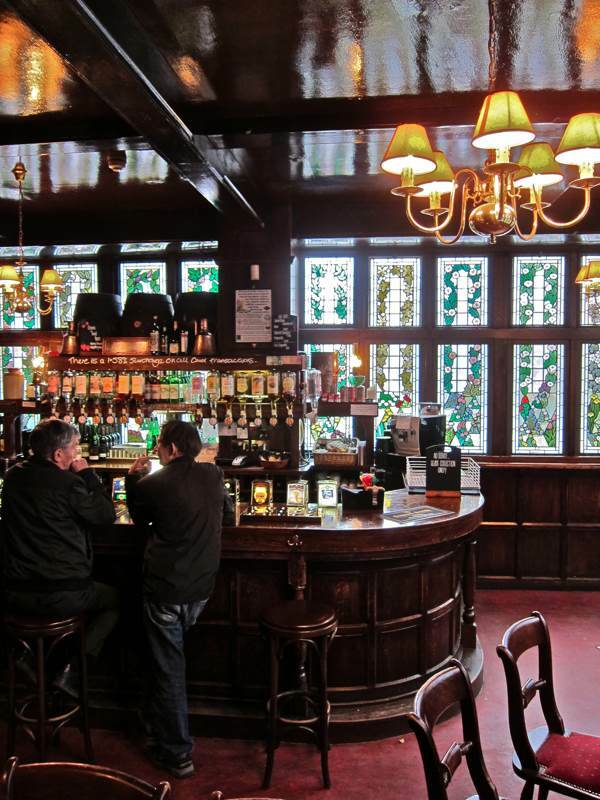 They strongly resist the loss of public houses in their area and consequently will be objecting.